CLEMSON -- The last two games for Amanda Butler’s Clemson Tigers (14-8, 5-4 ACC) have been tough as they have played two top ten teams in NC State and Notre Dame. The final top-ranked hurdle came in a 76-44 loss to No. 3 Louisville (21-1, 8-1 ACC) on Saturday afternoon. Clemson jumped out to a quick 4-0 lead energizing the crowd, but once Louisville got rolling, they were tough to stop, putting together a 16-0 run for a 16-4 lead early. Kobi Thornton and Chyna Cotton were able to end Clemson’s scoring drought, which lasted nearly five minutes. The Tigers were able to get within ten points at the end of the first quarter, down 20-10. Simone Westbrook and Destiny Thomas were a key part of the Tigers’ run in an action-packed second quarter as they pulled the Tigers within one point. Louisville withstood Clemson’s punches as the Tigers could never grab the lead trailing 35-27 at halftime. After a good second quarter, it appeared as if Butler’s squad was starting to play their game and could challenge one of the best teams in the country, but the second half didn’t go as planned as the Cardinals finally took over in Littlejohn. "This was a great opportunity for us to get better, but we’ve got to move on to the next one,” said head coach Amanda Butler. "February’s huge for teams with postseason aspirations so we want to improve a little bit every single day." Louisville came out of the locker room with lots of energy, after two quick layups Coach Butler was forced to call an early timeout down 39-27. Costly turnovers from the Tigers also aided Jeff Waltz’s squad throughout the contest. 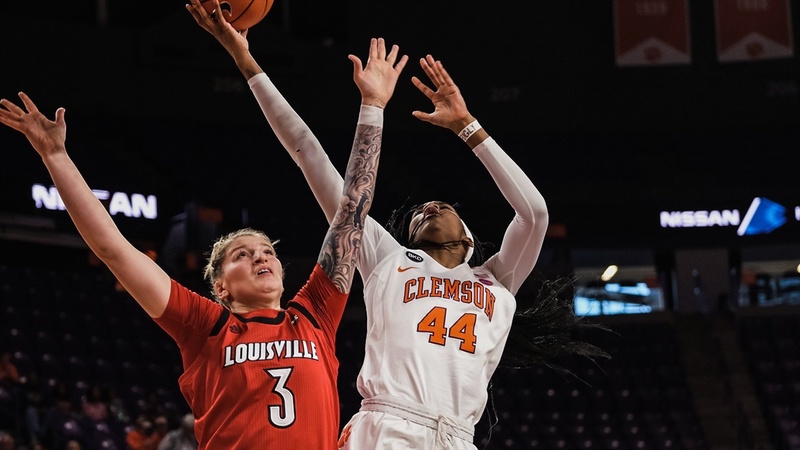 The Cards took advantage of another scoring drought from Clemson as they could not get anything to drop for an extended stretch, while Louisville added an 11-0 run and a 20 point lead heading into the final stanza as the rout was all but complete. Clemson will hit the road to face Wake Forest on Thursday for a 7 p.m. tipoff.